You have to give this place credit for coming up with a mouth wateringly delicious name. Chocolate Soup. Doesn’t it just conjure up the most delicious images? Well, prepare to be thoroughly disappointed. 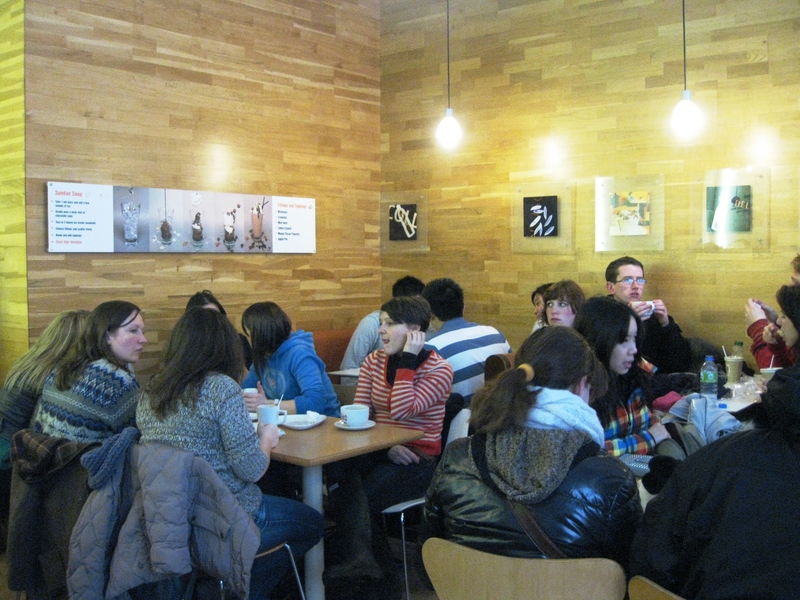 This café is also almost always full, which would normally be a good sign, but somehow I don’t think many of these people are regulars. As a result of being constantly busy, the tables are not often clear or clean. This is a problem, because the service is at the counter, so you have to order your drinks and eats before going to find a table (one of my pet hates), and you may not find one to your satisfaction. As for the product itself. 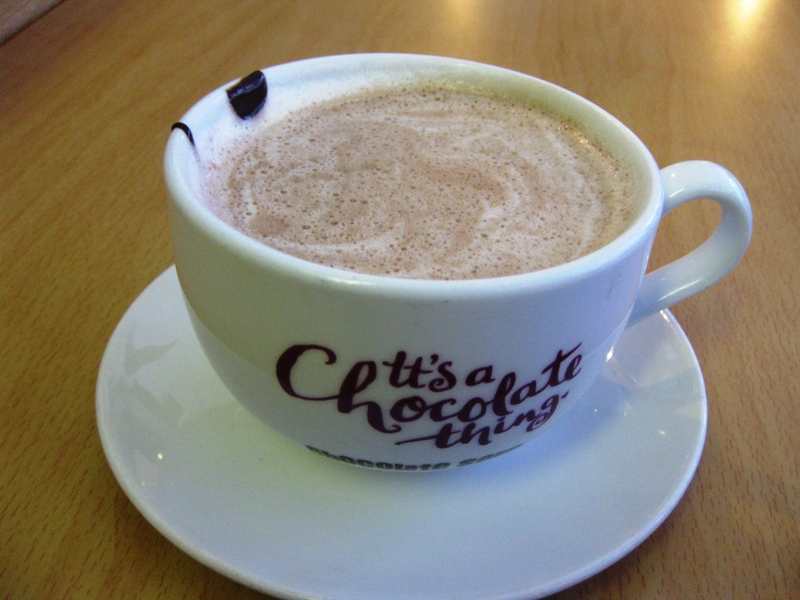 I went for a croissant and a dark, standard hot chocolate. I guess they just plop some syrup into the mug and add steamed milk. I found it far to sweet given the large size of the cup. Either go for sickly sweet in small volumes or take it down a notch or two. The croissant was very dry. I’m very sorry, but I can’t recommend this place. They have managed to strip, what would presumably once have been a very pleasant traditional Edinburgh interior, of all character, making this independent cafe feel like more of a chain. 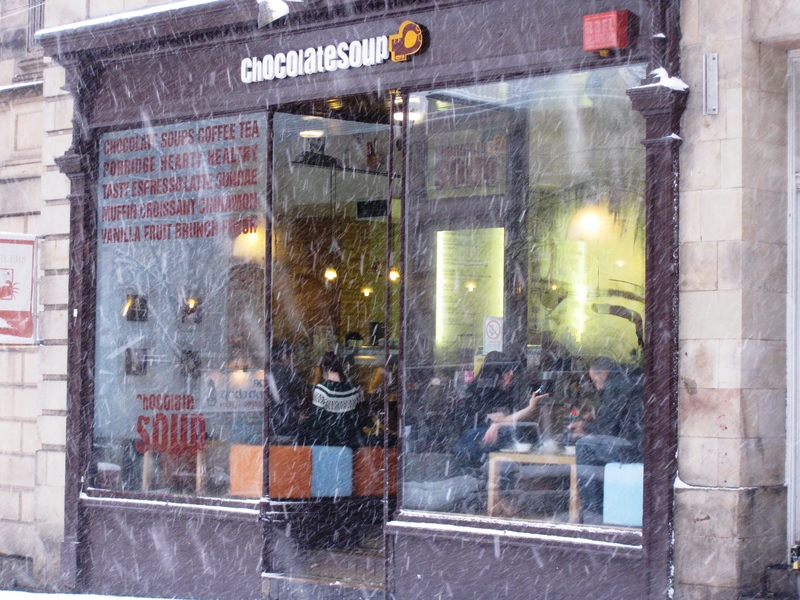 There are far better hot chocolates to be had in Edinburgh, and I shall be sure to hunt them out and review them. Artisan Roast for a start, though a coffee specialist, does a much better hot chocolate than Chocolate Soup. Steer Clear. I stumbled over your blog via teh website from the Edinburgh larder. Very nice and some great photos and reads! Thanks for giving your opinion on Chocolate Soup. This has actually on my “must try” list for a while. Might give it a skip after this!